Now that the 9/11 Defendants are being denied trials, what will be the reaction of those who once demanded them? On November 13 of last year, Attorney General Eric Holder announced that Khalid Sheikh Mohammed and four co-defendants would be put on trial in a New York federal courthouse and tried for perpetrating the 9/11 attack. This produced a shrill and predictable backlash from the Right as well as from many leading national Democrats, who argued that civilian trials were unnecessary because Mohammed could simply be held indefinitely under "the law of war" or at least put before a military tribunal at Guantanamo. But virtually all liberal commentators vehemently defended the administration's decision as compelled by the Constitution, the rule of law and our values. What we seem to be forgetting here is that trials are not simply for judging guilt and meting out punishment. We hold trials in public not only because we want a check on the government's behavior but because a key part of the exercise is a public accounting and condemnation of wrongs. Especially in great trials for the worst crimes they are public displays pitting one set of values against another. I could spend all day citing similar defenses from the liberal commentariat defending the Obama administration on the ground that by giving Mohammed a civilian trial, they were merely obeying the dictates of our Constitution, the rule of law, and our values. And Obama himself voiced similar defenses to justify Holder's decision, leading The Washington Post's Greg Sargent to note "what an epic cave it would be if Obama" reversed Holder's decision (and that's to say nothing of the hordes of Democrats in the political and media class during the Bush years who dramatically condemned imprisonment-without-charges as the embodiment of tyranny, creating a "legal black hole," "shredding the Constitution," etc. etc.). The administration has concluded that it cannot put Mohammed on trial in federal court because of the opposition of lawmakers in Congress and in New York. There is also little internal support for resurrecting a military prosecution at Guantanamo Bay, Cuba. The latter option would alienate liberal supporters. . . . The White House has made it clear that President Obama will ultimately make the decision, and a federal prosecution of Mohammed and four alleged co-conspirators has not been ruled out, senior officials said. Still, they acknowledge that a trial is unlikely to happen before the next presidential election and, even then, would require a different political environment. 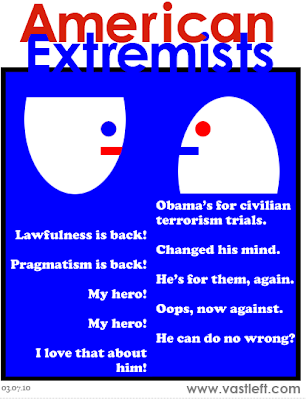 If it were true -- as most Obama defenders argued -- that giving civilian trials to accused Terrorists is not merely a good option, but required by the Constitution, the rule of law, and our values, then isn't it logically and necessarily true that Obama's refusal to grant such trials constitutes a violation of our Constitution, our rule of law and our values? And if so, doesn't this require rather severe condemnation from the same people who defended civilian trials as necessary under our system of government? After all, if the President is violating our Constitution, the rule of law, and our values, isn't that cause for some rather serious protest and denunciation, no matter his motives? It's true that this Post article relies on anonymous administration officials and notes that a final decision has not yet been made, but at some point, keeping Mohammed in a cage without a trial for a long enough time constitutes lawless, indefinite imprisonment whether the President formally announces it or not. We're clearly at that point. And, of course, it's long been reported that the President has decided to hold at least 50 other detainees at Guantanamo indefinitely without a trial or even a military commission. Imprisoning people without trials or even military tribunals is clearly the policy of this President. One of Obama’s most powerfully stated principles has been his rejection of the Cheney world view -- his insistence that the choice between upholding American legal traditions and the rule of law and maintaining our national security is a false one. If Obama does decide to try Mohammed in a military tribunal, won't the implicit message to the public be that there just may be something to what the Cheneyites have been arguing all along? But now, it appears Obama isn't even merely putting Mohammed "in a military tribunal," but far worse, simply imprisoning him indefinitely with no process at all, based on the same "war" theories that Bush and Cheney used to defend the same policy, to such great controversy and outrage. Indeed, the claimed power to put people in cages basically for life without charging them with any crimes, even though they were captured far from any real "battlefield," was the crux of the Bush/Cheney civil liberties assault. But what I'm interested in for the moment are those who defended Holder's decision last year on the ground that civilian trials were compelled by the Constitution, the rule of law and our values. I still vividly recall what happened when Obama reversed himself on the issue of complying with court orders to release torture photos. When he originally announced that he would release those photos, virtually every Democrat and liberal defended him from the Liz-Cheney/Bill-Kristol-led right-wing attacks by insisting that such transparency was crucial for our democratic values. But when Obama reversed himself two weeks later and announced that he would conceal these photos, many Democrats reversed right along with him and suddenly began arguing what Cheney and Kristol had been saying two weeks earlier: that concealment of the photos was justified by the imperative of National Security and Protecting Our Troops (I asked many times but never got an answer: was there a single Democrat who defended Obama's ultimate concealment of those photos who, based on their pro-concealment reasoning, had joined with Kristol and Cheney in criticizing Obama's original decision to release them?). Obviously, those who screamed bloody murder over Bush/Cheney Terrorism policies but now justify or at least acquiesce to the same policies when implemented by Obama have serious issues with partisan loyalties trumping honest advocacy. But it's when the Obama administration reverses itself -- such as with the torture photos -- that one's intellectual honesty is most conclusively tested: one's beliefs and principles can't shift with Obama's reversals if they're to be meaningful or credible. The same issue applies here: shouldn't anyone who defended Holder's original decision on the ground that it was compelled by the Constitution, the rule of law and our values now vocally denounce Obama for his profound violations of those same doctrines? If the Obama administration merited praise last November for upholding the Constitution, the rule of law and our values with civilian trials, then it must be true that they're now violating the Constitution, the rule of law and our values by denying them. Isn't that a rather serious offense? I'm not suggesting that anyone named here is guilty of this yet, but am just hoping that -- now that it's clear that civilian trials are being denied -- nobody will be guilty of it. UPDATE II: John Cole argues that this is the fault of Congressional Democrats, not Obama, because this is "yet another example of Obama trying to do the right thing, but not one Democrat had his back." No. First, there's no indication that Obama -- as opposed to Holder -- ever cared about or even was in favor of civilian trials; shortly after Holder made his announcement, numerous reports indicated that Rahm Emanuel was furious and the Obama White House quickly took away the power to decide from Holder. Second, Cole is definitely right that there was (as usual) ample amounts of Democratic cowardice to go around, but it's just not true that "not one Democrat had his back." As but one of many examples, Rep. Jerry Nadler (D-NY) "'applauded' Holder  for 'the decision to bring those individuals responsible for the attack on the World Trade Center to New York'." Pat Leahy and Russ Feingold did the same. And 45% of New Yorkers favored having the trial there, compared to only 41% opposed. Third, even conservatives acknowledged that the decision of where to try the 9/11 defendants is the DOJ's and Obama's to make -- not Congress'; from The Hill: "Despite the torrent of GOP outrage to the White House's decision to prosecute the professed masterminds of the Sept. 11, 2001, terrorist attacks in civilian court, at least one lawmaker admits that not much can be done to stop it from happening. Even conservative lawmaker Rep. Steve King (R-Iowa), not one known for shirking from an uphill fight, told The Hill on Friday that little can be done legislatively." Fourth, and most importantly, Obama took a Constitutionally-mandated oath of office that he "will to the best of [his] ability, preserve, protect and defend the Constitution of the United States." I wasn't aware that Constitutional guarantees and the rule of law could be dismissed with the wave of a presidential hand because members of the President's party in Congress want it to be. If that is true, then that reasoning justifies most of what Bush and Cheney did as well. The whole point of having a Constitution is that the Government is barred from doing certain things (e.g., depriving someone of liberty without due process of law) even when majorities demand it. This is Obama's doing; he ran on a platform of restoring the rule of law and the Constitution even when political expediency demands otherwise; and nothing forced him to abandon Holder's decision.